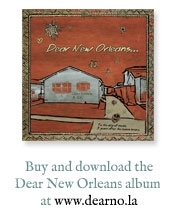 To mark the five-year anniversary of Katrina and the floods, dozens of musicians have contributed to the critically-acclaimed compilation, Dear New Orleans. The album benefits nonprofits working to support the region’s unique musical and cultural traditions and to protect and restore crucial community resources. This D.C. show pays tribute to the music and musicians of New Orleans with one-of-a-kind collaborations between album artists and celebrated New Orleans musicians with proceeds benefiting Dear New Orleans. In conjunction with our 10th Anniversary Policy Summit, FMC along with Air Traffic Control, present our own unique VIP music experience. $100 Doubloons package includes a ticket to the show ($20 value), two drink tickets, and an exclusive opportunity to meet some of the artists during soundcheck. $250 King Cake package includes a ticket to the show, two drink tickets, VIP access to soundcheck, plus a copy of Dear New Orleans CD, and a show poster signed by performing artists. Come witness the pre-show creative process in action, and help to revive the Crescent City’s legendary music community!